A brochure of the JDM market Mitsubishi Lancer Evolution X has been scanned and posted at the Lancer Register Forum, revealing to us the first official details and power ratings of the new rally-inspired sports sedan, though the car that the rest of the world will get might be slightly different in terms of power outputs. The 4B11T makes 280 PS at 6,500rpm and 422Nm of torque at 3,500rpm. 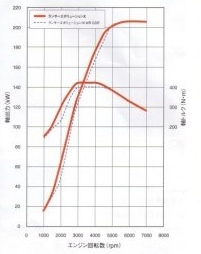 You can see the engine’s torque curve in the little graph embedded in this post. This is slightly better than the Evo VIII’s 4G63T that makes an equivalent output but lower peak torque at only 400Nm. Two models will be available – the GSR and the RS. The RS is the lighter, more bare basics version – so bare that it doesn’t even have that trademark Evo rear wing, knowing very well that owners will most probably dump it for a carbon fibre GT wing-type design. The GSR can be equipped with either a 5-speed manual or a 6-speed Twin Clutch SST gearbox, while the RS only comes with a 5-speed manual. Click here to view all pages of the brochure scan.